The heavy ring of eight bells have now been augmented to ten with the addition of two trebles cast by Taylors of Loughborough. All framework and fittings designed and supplied by Nicholson Engineering. Installation was under the supervision of Andrew Nicholson working with the local ringers. Completed 18th August, 2000. Last rehung in 1895 with new frame and fittings, little other than the most basic maintenance had been done since. Nicholson Engineering were contracted to undertake a full overhaul and restoration including rehanging with new gudgeons and bearings. After dismantling it was discovered that the steelwork to the bellframe was near the end of its useful life and complete reconstruction of the bellframe is currently in hand. Completion scheduled for 1st December, 2000. Last rehung in the 1930's in an oak bellframe, the relatively modern frame had sadly become dangerous due to serious decay of its foundation joists. The permeability of the Granite from which the tower is built was mainly responsible for the decay. The bells have now been rehung in an entirely new heavy hot-dip galvanized fabricated steel bellframe, all the fittings being overhauled and the bells rehung with new bearings. The bellframe has been constructed for six bells but with a grillage designed to allow easy augmentation to eight. Completed 8th September, 2000. Repairs to the tower continue. All Saints'. 6 bells, tenor c.131/2 cwt, keynote dependent on tuning. The six bells, mainly by Thomas Bilbie II of Cullompton, are being rehung with entirely new ringing fittings in the existing bellframe by Nicholson Engineering. 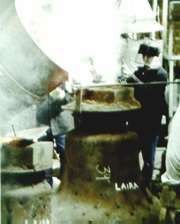 At the same time the bells are being retuned by the Whitechapel Bell Foundry. Completion scheduled for 10th November, 2000. By a mixture of founders the six bells were rehung by Warners of London, probably in the 1920's, with a new cast-iron and steel bellframe and all new ringing fittings. The bellframe was not well designed and this allied to poor construction of the tower led to severe structural distress. The tower is being repaired and strengthened. Nicholson Engineering are rehanging the bells using mainly original ringing fittings in a completely new bellframe supported on a double foundation of steel joists, all carefully designed to take full account of the structural weaknesses to the tower. Completion scheduled for 15th December, 2000. The bells are rung from the ground floor of the west end tower. In the clock chamber is a large c18th chime barrel. Unfortunately the only way of pulling of the chiming hammers is by a crude system in the clock chamber and this has led to severe damage to the mechanism in the past, visiting ringers often being unaware of the arrangement. We are currently installing a proper pull-off mechanism, together with a lever in the ringing chamber. Completion imminent. The church previously had a single bell by Llewellins & James of Bristol which was taken into stock by us and has now been sold to Kirkby Malham in Yorkshire to become part of a new ring of six. A completely new Whitechapel eight has now been supplied and installed by Nicholson Engineering, the result receiving wide acclaim from ringers and parishioners alike. Completed 21st July, 2000. Following a broken gudgeon to the fourth Nicholson Engineering were contracted to replace both gudgeons, at the same overhauling or replacing some other parts of the fittings. All dismantling and reassembly is being undertaken by the local ringers. From commencement to completion the work should be complete in just two weeks, demonstrating the speed with which we can deal with emergency work. Both bells by Rudhall, the smallest had become very badly cracked and all its fittings and framework were derelict. The bell has now been welded by Soundweld. Nicholson Engineering have designed and made new framework and fittings and rehung the bell. Completed 31st August, 2000. The chapel is superbly located on the top of a hill at the neck of the Stanley peninsula on the south of Hong Kong island. Of relatively modern construction the church was never provided with a bell. Earlier this year we took into stock the old tenor from Wapley in Gloucestershire where we remodelled and augmented the bells. The bell has now been restored and is to be hung for stationary chiming including an electric tolling hammer complete with full electronic control. Bell due to be shipped end September 2000. Completion scheduled for end November 2000 following installation entirely by local labour. This previously notoriously difficult ring of eight were rehung by us last year with entirely new fittings in the old bellframe, tuning being by The Whitechapel Bell Foundry. The parish has now had the restoration of the clock attended to and we are undertaking the restoration and modification of the clock hammers as part of that work. Completion scheduled for 19th September, 2000.